Yes, fibromyalgia tender points are different than the trigger points detailed in our Trigger Points article. It is important to know this in reference to the origin of pain. 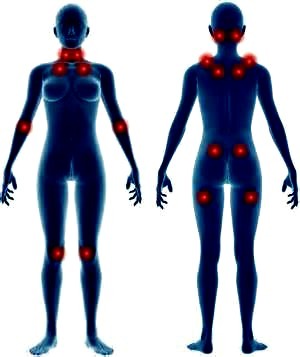 People with fibromyalgia often feel "tenderized" in these areas shown. You might describe it as a bruised feeling or tender to the touch. The standard 11-18 fibromyalgia tender point evaluation is just one tool that is used to diagnose fibromyalgia. The tender points test is generally the first test utilized by treating doctors, although the criteria for diagnosing has changed and some may not always use this area of diagnosis. We believe it is important when used with the other diagnosing methods. Unlike trigger points, tender points do not radiate pain to other surrounding areas when palpated. Tender areas feel sore and tender to the touch, often times on a regular basis. A person does not need to have all 18 points and can even have less than 12, if other symptoms are also present. The adjacent graphic shows the 18 standard fibromyalgia tender points, both front and back of the body.It is essential to note here that fibromyalgia is much more than 12, 16 or 18 tender points on the body..
Fibro is a multi-system, complex illness that is still greatly misunderstood or denied by many conventional doctors.When using the 18 point evaluation test, a doctor will palpate these points or areas and then ask the patient to rate their pain level at each point. Starting at the back of the head, neck, down to the scapula, lower back, buttocks and down to the knees. It is important to understand that if you have chronic headaches, the points in the back of the head, neck and scapula area could very well be contributing to pain. Migraine headaches, sinus pain, TMJ pain, or chronic neck pain..all of these can stem from these upper body points. With chronic lower back pain, the points around the buttocks can exacerbate and cause increased pain and mobility issues. These lower points are also very closely associated with SI joint pain. Just as we reference in the article on Fibromyalgia Leg Pain, these tender ‘points’ are more like tender ‘areas’ and can involve surrounding tendons and ligaments as well. If utilizing physical therapy or massage therapy, it is important to reveal both tender points and trigger points to your attending therapist. One of the first things we need to do with tender areas of the body is to treat any underlying inflammation. Many people have inflammation factors of some kind. We want to look at everything that can contribute to inflammation from our diet (anti-inflammatory diet) to lifestyle to other aggravating factors like trigger points. We also need to effectively treat the fascia on the body which can become dysfunctional. You can visit the fitness page, Fibro Fit People, for videos (video section) of different ways to treat fascia. Always modify where needed, but know that anyone can treat fascia. Also note the link at bottom of this article for many natural therapies for fibromyalgia that we recommend. And although everyone’s pain threshold is different, it is essential to understand the difference between discomfort of pain that is healing to the fibro body VS. pain that is detrimental. It can take years for a person with fibromyalgia to discern this when it comes to activities or body work. Keep working at it. For instance, the tendons and ligaments in our body can only become stronger and more agile through training and daily strength applications. In other words, we have to put a healthy amount of stress on them just like in the case of our bones. Bone health is dependent on pressure applied through safe and effective strength training. Inactivity and loss of agility will worsen pain in these tender areas and increase overall symptoms within fibromyalgia. “We cannot afford that” ..
As a practitioner and fitness trainer specializing in fibro, it is my job to help people distinguish between the two and to avoid what we therapists call ‘perceived barriers’. Never assume anything or this could lead to missing out on potential healing therapies. Learn to work WITH your fibro body or it will continue to dictate and have greater control. Taking control, using mastery techniques ..it can be done ..not as a cure but as conditioning for mind and body. This creates a stronger bodily foundation and overall resilience. It is important to note that this is not mind over matter …No, it IS mind and body working together..
Just like with TRP’s, it is important that we lessen our aggravating factors and implement more ongoing healing factors.